A vivid, electric tale set in New York and personally recommended by bestselling author Nick Hornby (Fever Pitch, About a Boy): These Days Are Ours is an irresistible coming-of-age story for the Lena Dunham generation from debut author Michelle Haimoff. New York City, six months after 9/11: everything has changed and nothing has. Hailey graduated college months ago but she's still living in her family's Fifth Avenue penthouse, spending her nights falling in and out of bars across Upper East Side Manhattan - and the thrill is starting to wear off. It isn't easy being young, rich and beautiful. Overnight, it seems like everyone has their lives completely sorted. Katie has a great job at Morgan Stanley, Michael Brenner is training to be a human rights lawyer and trust-fund kid Randy is just content to carry on having fun. Hailey is lost somewhere in the middle, torn between chasing down the next wild party and admitting that it might be time to grow up. She craves something more meaningful - but what? Perhaps Brenner holds the answer: gorgeous, charismatic and aloof, Hailey is convinced he is the missing piece in her puzzle. But when she meets Adrian, a man so totally different from her usual privileged crowd, she begins to realise she's been looking for happiness in all the wrong places... These Days Are Ours captures the feverish excitement and exhilarating uncertainty of the city, where bright young things are forever brimming with possibility and buckling under the pressure. Michelle Haimoff is a writer and blogger whose writing has appeared in The New York Times, The Los Angeles Times, PsychologyToday.com and The Huffington Post. She is a founding memebr of NOW-New York State's Young Feminist Task Force and blogs about feminist issues at genfem.com. She was raised in New York City, curently lives in Los Angeles, and can be found online at MichelleHaimoff.com. 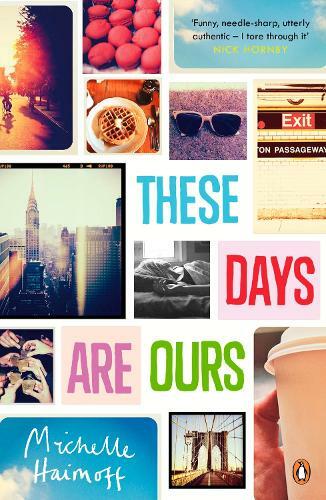 These Days Are Ours is her first novel.